Unfortunately, satire is being believed and shared as fake news! Yet, Satire is satire. Satire has been around for a long time. Satire uses writing techniques such as: exaggeration, incongruity, parody, criticism, ridicule and reversal. When Satire is used in the news, it can affect our perceptions. In fact, many individuals will believe satire and share it as truth despite it being written as satire without the intent to be malicious or be identified as False/Fake News. Satire aims to poke fun at humans and/or organizations. Political cartoons with exaggerated facial features are also forms of satire. 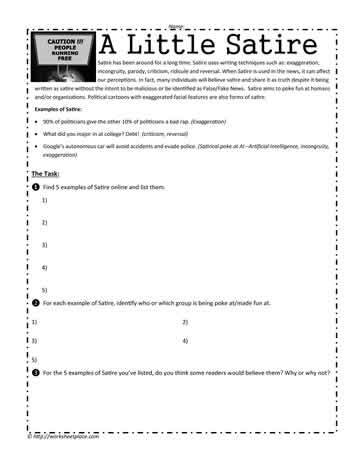 Complete the Satire worksheet to better understand what Satire is.